At present, competition is very intense. The key is cost. Power consumption of motor accounts for 30% of cost. Motor driving fan is a big part. So it is very important to reduce consumption of motor. Today, phenomenon of "large horse drives small dolly" is serious. If technology of variable speed is adopted, it not only satisfies production requirement but also saves energy. Meanwhile, variable speed drive saves a lot of energy source and improves efficiency for plant. After innovation with variable speed drive, energy saving rate is in 30-50%. The investment usually recovers in one or two years. 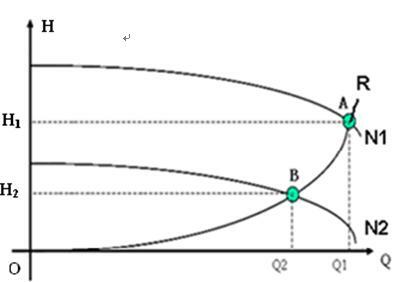 When fan works in A, air flow is Q1，pressure is H1. Keep fan speed constant, adjust air flow to Q2 by baffle. Pressure will rise to H2, fan work point is B. 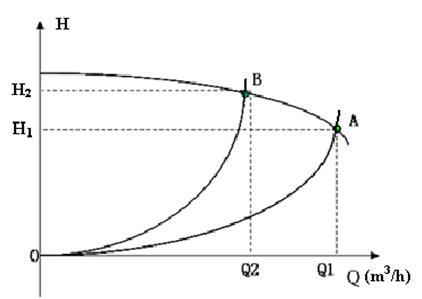 Because of baffle throttle, resistance curve of duct is changed to OB. When fan works in A, its power is PA＝H1×Q1/102；when in B, its power is PB＝H2×Q2 /102. Q2<Q1， but H3>H1，so PA PB do not change a lot. It indicates that in direct on line state, shaft power of fan reduces little when air flow is changed. 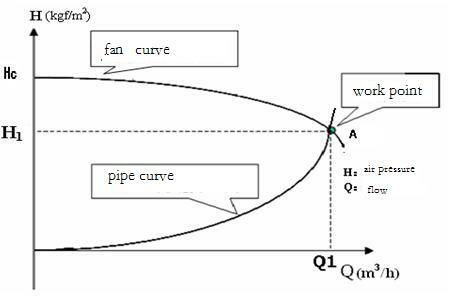 It indicates network curve keeps unchanged, change fan curve. Usually, do not change fan outlet, change fan curve (change fan speed) to change air flow. When fan works in A, its power is PA＝H1×Q1/102；when in B, its power is PB＝H2×Q2/102. Q2<Q1，H2>H1，so PA PB change a lot. It indicates that in variable speed state, shaft power of fan reduces a lot when air flow is changed. Energy saving is considerable. If 100% speed -100% flow -100% pressure-100% output power，there is: 80% speed- 80%flow- 64% pressure- 51% output power. Namely, in variable speed state, when flow reduces 20%, shaft power reduces 49%. That is the reason why variable speed drive has a considerable energy saving effect. Disadvantage of liquid coupling: efficiency is lower with speed reducing. Installation needs cutting off connection of motor and load. Site is dirty and needs much maintenance. With water resistance, there is still 3 times of rated current to impact grid. And water resistance starts slowly, which makes water boiling. It has large throttle loss and low inlet pressure, low efficiency with valve control. Therefore, take account of variable speed technology to control. It not only solves problem of low efficiency of valve but also improves economic index. What is more, it reduces throttle loss and wear and tear on valve, lowers temperature rise, prolongs equipment lifetime, saves energy and lowers power consumption. By soft start, start current is smaller than rated current. Start is more smooth. Improve efficiency, eliminate throttle loss. Process technology is improved and equipment lifetime is prolonged. After reform with variable speed drive, 41 down harmonic can be eliminated because of cell-cascade. Total voltage harmonic is controlled in 2%. Total current harmonic is less than 4%. PWM control makes output voltage waveform near sine. Total harmonic is less than 1%. Above indexes all satisfy IEEE-519 standard. Voltage source instruce, power factor can be 0.95. Baffle control has disadvantages of much consumption, inferior economic benefit and bad damage. Technology of variable speed can reduce consumption and heighten economic benefit. The practice proves that variable speed drive is necessary, feasible in cement plant and has considerable economic benefit.